A good Homeopathic medicine finder can be a Godsend in getting the right remedy quickly & accurately. Unless you are a homeopath, finding the right single remedy is not easy. You need really good skills or a homeopath to do that. There are times when a homeopath is not available e.g. the middle of the night, weekend, vacation etc. Wouldn’t it be great to have access to a homeopath 24 hrs a day, 365 days a year, without ever leaving your house and all you ever needed was an internet connection. Our homeopathic medicine finder called the Smart Remedy Finder can replace a homeopath for some ailments. Well that access to a homeopath, 24 hrs a day can now be had if you have an internet connection. We present our homeopathic medicine finder called the Smart Remedy Finder, probably the most advanced remedy finder available on the web & its FREE! If you have used other remedy finders on the internet, you will know that they are mostly inaccurate & difficult to use and almost never give the results which can be understood by a layman. Most of the remedy finders either assume that you are well conversant with the rubrics (symptoms) of homeopathic language or try to make it overly simple and it reduces accuracy drastically. We believe that we have achieved that soft spot which no other remedy finder has, the optimum balance between being simple to use and be accurate at the same time. This is done by being interactive & smart and only asking relevant questions. It is FREE to try, you have to use it to believe all that we are saying. In most cases, the correct remedy can be found in 3-5 minutes. The homeopathic medicine finder called the Smart Remedy Finder gets you to the right remedy within minutes, anytime of the day, without the need of a homeopath. Too good to be true? 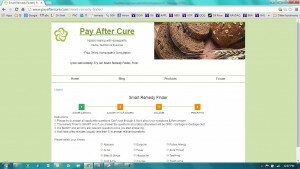 You can try it free at our site (www.payaftercure.com) and decide for yourself if it offers what you were looking for.